One thing toddlers love is to explore and indulge their senses. It’s exciting and new so anything which enables them to put their new skills to use is always welcomed with glee. Creating your own “senses” game will keep your toddler entertained for hours and it’s educational, too. You can create a game which focuses upon one, two or all five of these senses if you want. If you focus on one at a time, however, it gives you the opportunity to create five different games. Typically, touch and sight tend to be the easiest and most enjoyable for toddlers. Taste and smell related games are better suited to slightly older children. So here, let’s focus on a couple of touch related games. A good educational touch game is to trace the outline of either numbers or letters of the alphabet. Then, give your toddler various decorative supplies to fill them in. Focus on different textures such as cotton balls, glitter, beans, sandpaper and pipe cleaners. Your toddler will love the different feel of each item as they stick them into the spaces. Another great touch game includes filling items with different textured ingredients. So, filling bowls with pasta, rice, goo, pipe cleaners, cotton balls and anything else you can think of. It’s a very simple activity, but your little one will love hearing the sound of the items filling the bowl, then the feel of them as they dip their hands into the bowls. These are just a couple of ideas. If you look online, you’ll come across loads of different sensory game ideas you can try. Does your toddler love to boogie? Dancing games can be really fun for both you and your little one. The freeze dance is particularly enjoyable, challenging your toddler to freeze in a certain position when the music stops. This can be done in a few different ways. The least challenging is to get your toddler to simply freeze in whatever position they are in once the music stops. If you feel that’s too easy and less likely to hold your little one’s attention, try asking them to freeze in specific positions. It could be that once the music stops they need to get into an animal position for example. You could even turn it into an exercise related activity where your toddler needs to switch to a gentle toddler-friendly yoga pose. 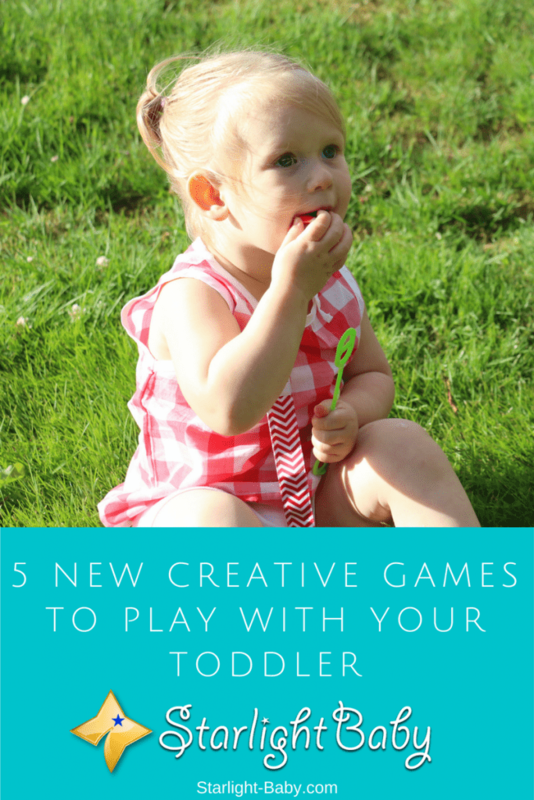 You’ll be surprised just how much toddlers seem to love this game! Toddlers naturally love to explore so what better way to take advantage of this than through a homemade scavenger hunt? This activity is something you can prepare for in advance, or even make up on the spot if required. It’s also a fantastic way of keeping them entertained while out shopping. You could ask them to find various items in a store, for example, or ask them to identify items that are a specific color. At home, you could label various items such as the refrigerator, table and chairs, then ask your little one to find specific items. Asking them to find things and then providing a reward at the end is a surefire way to keep them entertained and even do a few small chores at the same time. Asking them to find a pair of socks, for example, or find a toy in another room and place it into the toybox is a very subtle and enjoyable way to get them to tidy up a little. This is an activity which your toddler will never find boring! Sometimes, it’s the most basic tasks that keep toddlers entertained for hours. If you’re looking for an activity that educates, as well as keeps your little one busy, color sorting is a great idea. For this you’ll need lots of different colored items. It could be building blocks, card or even teddies. You’re also going to need either large paper bags or empty boxes for each color. Attach a piece of paper to each bag or box, representing each color you want your little one to identify. Then ask them to place all of the blue items in the blue bag or box, the red into the red one, and so on. It’s one of the simplest ideas, yet it’s also one of the most effective and enjoyable. Another very simple idea is to give your toddler tissue paper to play with. This is a great one when you’re stuck inside due to poor weather. At various times throughout the day, place tissue paper down onto the floor. Try to invest in different patterns and colors as this will hold their attention for longer. At first, they’ll simply enjoy picking it up and looking at it. Then you can encourage them to crumple it, throw it, rip it or whatever they want to do with it. It’s amazing that something so simple can be so enjoyable! You can also expand on this idea and place tissue paper in various places around the home. Combine it with the scavenger hunt idea and get your little one to find all of the pieces of tissue paper hidden around the home. This is a especially great creative game if you’re on a budget. The above will have hopefully given you some great ideas the next time you’re looking to do something new with your toddler. It’s hard work coming up with new exciting ideas every day, but as you can see from the games above, it’s often the simplest of things which provide the most enjoyment. Do you have any other great creative game ideas? We’d love to hear about them below! These activities sound fun! I have a toddler now, though he might still be very young for these games (he just turned one year old), I will start with the senses game as my toddler like to explore now. Thanks for sharing these good ideas! Hello, kaka135. I hope you have already tried some of the creative games we have here. This is fun, all those games are going to make a child to enjoy the time with its mom. I think that freeing and paper tissue game is one of the games that my wife already tried it. These games develop our baby’s mind, moves and the spirit of gaming! This is awesome for children! please don’t teach them to play games on tablet or online. It is not good for their upbringing. It is always perfect to kids to play games like this. True, jose. It’s not good to allow kids to just sit and play using gadgets. I’ve read that playing with gadgets negatively affects a child’s brain, and could cause attention deficit, problems with cognition, etc. Games like the ones listed here are not only fun but definitely good for their health and overall well-being. Parents should always encourage their kids to engage in games that involve physical activity. A friend of mine always says, a parent or adult should always play a fool or act like a kid in an attempt to understand or bond with kids better. Your points above seem to agree with his thought in someways. Freeze dance sounds all too familiar to me. It’s one fun activity me and my siblings enjoyed a lot. It was so fun for kids back it became one important activity in every kid’s birthday party in my neighbourhood. Good points by the way. Parenthood does tend to make adults forget the child within because we tend to get caught up in all the hustle and bustle of raising children. A playtime with toddlers could help not only a child but also the parent because it entertains the child and relieves the adult of stress. Playing with our little ones can be a great way to build up bonds with them and it’s good to have that experience where they will feel comfortable around us. One thing about playing with our little ones, as siblings or as parents, is that it is going to increase the amount of communication we share with them and these playing tips can be useful when it comes to that. Personally, I’m very good with kids especially in their infant age. I can carry them and play with them listening to them giggle all day and smile before falling asleep without me getting tired of carrying them. Some parents do complain that their baby is too heavy for them to carry all day but I don’t think I have carried any baby that gives me such concern. Playtime is truly a great bonding moment with one’s child. This is one of those moments a child will always happily remember when he/she becomes an adult. It also makes a child feel closer and comfortable to be with his/her parents. My little cousin have taken so well with painting and they really like it very well. Although they give me one hell of a job in washing their paint stained clothes, it’s still fun getting to see them so happy in the paint act. We normally go to our backyard and spray some clothes on the floor and get on with the painting job. It may be hard work to clean the mess at the end of the day, but these moments you’ve shared with your cousins will make them love you more than any of their other cousins. Cousins whom we are really close to are like additional siblings whom we share loving bonds with until we grow old. Exactly @Elsa, the love bond is indeed strong between us all and they are always happy and excited having me around. You wouldn’t believe it if I tell that I actually put up one of the painted clothes up for sale and someone bought it. The painting looked like a design on the cloth. soon my baby will enter the toddler stage. Most of the parents that I am in touch these days, toddler stage is really difficult. First of all suddenly your baby begins to demand and they don’t buy NO. No matter what, you will always have to fulfill their desire. Secondly, the toddler is very active. You will always have to watch your toddler because he/she might easily get hurt. That’s true, vinaya. Most parents would agree that the toddler stage is the most difficult phase in a child-rearing. Every day seems like a struggle when you’re raising a toddler, haha. Be consoled by the fact that this phase will pass eventually.